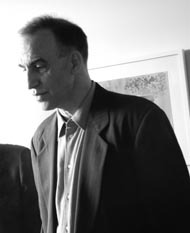 Wherein we catch up with downtown New York icon of cool, John Lurie - founder & leader of the Lounge Lizards, soundtrack composer, pioneering reality TV show star, and artist. He’s got quite a resume and he’s managed to do it all with his own distinctive sense of humor and style. View and buy his art, as well as his music, at http://www.strangeandbeautiful.com/. PSF: So let's start: Where did you grow up, and how did music come into your life? JL: I was born in Minneapolis. Then we moved to New Orleans and after that to Worcester Mass. When I was about 15, my sister gave my brother (Evan) a harmonica for his birthday. I borrowed the harmonica and got pretty good on it, very quickly. Within a year, I had sat in with Mississippi Fred McDowell and Canned Heat (circa 1968). PSF: Wow! Where were you when you played with them? Were you aware of who they were at the time? Was that the start with music your brother Evan as well? JL: Yes, I knew who they were. With Fred McDowell, I was in the audience and people kept bugging me to take my harmonica out and sit in. I felt shy but in between songs, I let this line wail out from the crowd and he invited me up. With Canned Heat, we had hitchhiked from Worcester to see them play at Carnegie Hall. After the show, we were standing on the corner at 57th with nowhere to go. We saw the band start coming out. I said, "I play the harmonica and I would like to sit in with you. We will hitchhike to where ever you are playing next to show you I am serious." Bob Hite, the singer, said, "Suuurrrrre." We hitchhiked to Philadelphia and snuck into the Spectrum at like noon. And waited forever for them to arrive. They were actually excited to see me, which was odd. Bob Hite had me play for a moment, while Henry Vestine sat over in a corner playing the weirdest thing anyone has ever heard on the guitar. Bob The Bear Hite goes, "Okay, first two songs are in E." I played with them in front of 20,000 people. It was quite surreal. PSF: That's insane! What were you guys into at the time, as kids in the 60's? Obviously some blues stuff, but where did the jazz stuff start coming in? Were you listening to just about anything you could at the time? I've heard Tom Waits refer to the fact that he sort of skipped the popular stuff in the '60's- Blue Cheer, etc..
JL: Evan and I both started on harmonica but he switched to piano pretty early. We would just listen to everything, like we were searching for gold or something. PSF: Were their any records in particular that you heard as a kid that completely took you in & sort of steered you in the direction of pursuing music? JL: We were obsessed with Little Walter and to a lesser extent Muddy Waters and Otis Spahn. We had been into a lot of stuff but the only thing that held was the Beatles and Hendrix. We knew that the next step was jazz, but a lot of it I didn't like. We heard Les McCann and Eddie Harris, which made a good bridge and then Eric Dolphy's version of "God Bless the Child," which I listened to over and over again. Someone played me Coltrane's Live at Birdland, but I didn't get it. I was fascinated that there was music that I just couldn't understand. PSF: How did you know the next step was jazz? JL: I don't know how to explain exactly. You're 15 or 16, you see that the older musicians that you respect are into this stuff but you don't quite get it. It’s kind of like looking over a fence. PSF: I had a similar experience when I started listening to Thelonious Monk. I didn't really get it, but there was something I liked about it. After a couple of years, I started understanding it. So it sounds like you guys were really serious about music pretty early on - is that fair to say? JL: Yes, serious. But we were teenagers, so it was late in a way. PSF: Did you start painting around the same time? What was your parents' attitude towards your creativity? JL: I started painting when I was very young, a child, like everyone else. But I never stopped. So in some way I was painting before the music, but it was just something I did. I am quite sure that at a young age, my parents were very responsible for something in Evan, my sister, Liz, and myself, though I am not sure if I can put my finger on it exactly. It was not like they were overly encouraging, but somehow (they) instilled in us a confidence in following our own path. JL: When I was about 17 I knew that I was going to be serious about music. Before that I thought, fairly certainly, that I would be a writer. Before that, I thought I would be a forward in the NBA. And before that I thought that I would own a snake farm. PSF: You’re probably just about tall enough to have played in the NBA. What sort of records do you remember being around when you were growing up... you know, stuff your parents listened to? JL: They listened to Gilbert and Sullivan. They listened to all kinds of stuff. My dad had a Miles Davis record, the soundtrack for that Louis Malle film, Ascenseur pour l'échafaud (Elevator to the Gallows), or something like that. After I had done my first couple of film scores, I heard that record by chance and was a little shocked at how heavily I had lifted from it. But then they started only listening to the Shaggs. They would put on funny clothes and listen really loud. It was very disturbing. JL: No I didn't go to college. I hitchhiked across the country. PSF: Was there a plan or did you just drift around? What sort of mischief did you get up to? JL: I have gotten into an enormous amount of mischief in my life. I am probably at the top of the mischief making list. I am quite fond of mischief. However, this period we are talking about was right after my dad had died and pretty much all I ever thought about was "Why am I here?" and "What, if anything, does it make sense to do in this life?" PSF: Wow... So where did you go and what did you discover? JL: I went a lot of places but ended up in Berkeley, California. It had all been happening there, a year or so before, but now all you could smell was burning synapses. In the back of a van on the way back across the country, somewhere in Texas, I thought, "If there is a God, let a red light show up in the sky." Then I saw a red light in the sky. It was the top of a radio tower. I don't know if that counts. I have a painting that I am working on now, of a man staring at the sky, entitled, "Dear God, I asked you a direct question. For once, could I get a direct answer?" PSF: What sort of sign did you take that as? Was it more confirmation that you're not alone and living your life was/is not in vain? JL: No at the time I took it to be not a sign. Like almost proof of the reverse. The negativity of a young, angry man. PSF: Do you believe in God or some sort of higher power? JL: I don't think that question is allowed in interviews. (ED NOTE: Understood!) I am quite sure that there is something going on. PSF: I digress... So what happens next - your family was in Worcester by then, right? Did you head back there or had you made up your mind to go somewhere else? JL: My mom and my brother were still in Worcester then. Yes I went back to Worcester and shortly after moved to Boston. PSF: Were thoughts of a band running through your mind? What happened there? JL: Well, no not really. We had had a blues band called Crud, but then at this point, I was floundering. I mostly walked around in the middle of the night trying to figure out what was going on. PSF: Crud is a great name for a band. Tell me about coming to New York. What was happening here at the time? JL: I first came here to live I think was in '74. I'm sure that there was a ton happening that I was not aware of. What I was interested in at that time was the avant garde jazz scene. I was shocked that heroes of mine, people I saw as celebrities, were absolutely poor and struggling. There was the loft jazz scene, which in retrospect was pretty thin and myopic. PSF: I was going to ask you about the loft jazz scene but I guess there's not much to discuss. Did you get caught up in the formative punk/downtown scene? And when did the Lounge Lizards start coming together? JL: I had been in London for the inception of punk and I thought, "What? This is stupid." I came back to New York, to the Lower East Side and met all these very wild, creative people. Just ferocious. I saw bands like DNA, Theoretical Girls, Boris Policeband, the Contortions. The attitude was so, so real. Musically, it wasn't so much, except for the Contortions, which I thought was brilliant. And people were making movies, which to be honest also weren't very good, but the energy was very dynamic. The jazz thing was just lost. It was over somehow, there was no big voice. So either musicians were playing this very polite music so people could eat their meals in an atmosphere or they were playing this very indulgent, frenzy stuff, where clearly nobody was listening to each other and then they would come off stage and complain they weren't getting any grants. So I got caught up in this scene that was not exactly punk but held a giant amount of irreverence, which to me made a lot of sense. PSF: Was your brother Evan in New York yet? I guess this was around the time you guys started meeting the future Lounge Lizards (first edition) - Anton Fier, Arto Lindsay and Steve Picollo. How did the band come together? JL: Yes, Evan had been there before and then moved to London. He came back to New York right before we started the band. JL: OK, the saxophone and how it came to me. This was the period that I was walking around at night. I was playing guitar, but still searching for a different way. I was on Main Street in Worcester, Massachusetts at 4 AM, just walking around. I ran into this black guy, he was about 22. This guy was pushing a wheelbarrow full of dirt down the street. He explained that he was going to plant an organic garden on his roof. He also told me that he had just seen a statue turn into an angel. He said it in such a way, that I believed him. We started talking about music. He took me to his house where I had to be very quiet because his mother was asleep. He gave me a tenor saxophone and a bicycle. This is how I started playing the saxophone. PSF: Sounds like a movie! So by the time the band came together, you had been playing for a few years. Tell me about the early version of the band - was it an organic thing that came together through playing together or was the sound from your direction, out of your head, so to speak? JL: I had in my head for very long time a band that could play melodies like classical melodies from the early twentieth century, Varese, Webern, Messiaen, yet it would be improvised and have the hypnotic feel of more exotic musics, like from Bali and Africa. Still at the same time, it would fit together like a band, not just a bunch of musicians who were hired, but more like how the Beatles were. And still on top of all this, I wanted it to be more like when we performed it was a ritual and not a gig. Of course, I didn't really believe that I would be able to pull this off. I had been jamming with people from the scene I mentioned earlier, so Arto Lindsay, Eric Mitchell, James Nares and whoever else might be around, got together several times and played or bashed really. It was quite amazing, we would just switch instruments at random, these guys didn't really know how to play but it didn't matter because I would be playing the drums part of the time. These jams were amazing. To that point it was the best music I had ever played with people. And for sheer energy, it was the most powerful music that I ever played in a group. Evan had just moved to New York, so when Jim Fourrat asked me who was a good band to open for Peter Gordon on a Monday night, I said 'my band.' So it was Arto, Evan and me. Arto brought in Tony Fier and I called Steve Piccolo who was our friend in high school and the bass player for Crud, but was now the VP for Merrill Lynch. I had been writing music for a movie I wanted to make called Fatty Walks. We had 2 rehearsals and did the gig. We also bought as much cocaine as we could possibly afford. Drugs have ruined a lot of gigs and of course a lot of other things but they made that gig better than could possibly be expected.